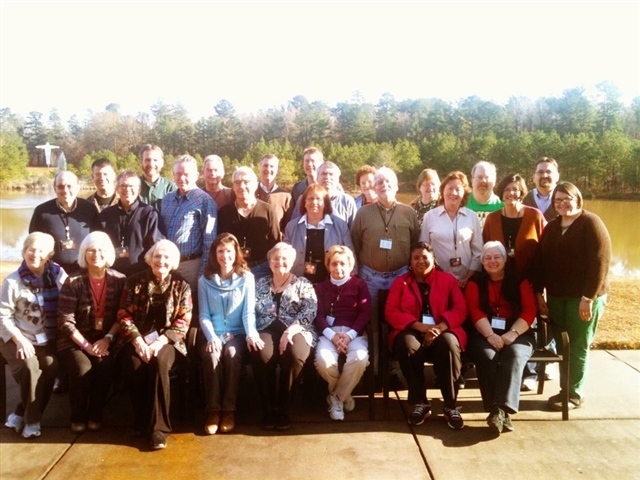 Participants from Nevada, Georgia, Texas, Ohio, Mississippi, Iowa and Louisiana gathered at The Wesley Center from Jan. 6-11 for the 2013 Louisiana 5 Day Academy for Spiritual Formation for a week of worship, learning, celebration and prayer. The theme for this year was Spiritual Leadership in Times of Change and lectures were presented by Daniel Wolpert (Director of The Minnesota Institute of Contemplation and Healing, www.micahprays.org) and Dr. Roger Owens (Duke Memorial UMC, Durham, North Carolina). Owens lectured on post-modern spirituality each morning. In the afternoon, Wolpert presented on the topic of spiritual leadership. After each lecture, participants entered an hour of silence for reflection followed by plenary discussion with the faculty. Before dinner each evening, the community gathered for worship and communion. Elise Eslinger, editor of The Upper Room Worship Book, served as worship leader for the week. Homilies were presented by members of the retreat leadership team. Listening circles provided participants with an opportunity to process the insights of the day with a small group of fellow sojourners. The leadership team is composed of alumni of The Two Year Upper Room Academy for Spiritual Formation. Members of the leadership team were Donnie Wilkinson, retreat leader; Linda Beasley, spiritual director/listening circles; Greg Davis, theologian; and Dianne Wilkinson, registrar. The event was sponsored by the United Methodist Foundation of Louisiana. Praying the Scriptures, Praying the Hours is the theme for the next Louisiana 5 Day Academy. Faculty will be Sister Kathleen Flood, O.P. and Robert Benson. The event will be held at The Wesley Center February 9-14, 2014. More information about the 2014 Academy can be found at www.la5day.weebly.com.